An 8-year-old boy in Australia had high levels of lead, a toxic metal, in his blood for more than two years for unexplained reasons, until doctors found lead pellets in his body, trapped in an unlikely place, according to a new report of his case. Doctors had tested the boy for toxins in looking for the cause of his unusually hyperactive behavior. They found levels of lead in his blood ranging from 17.4 to 27.4 microgram per deciliter, much higher than the level of 5 micrograms considered normal. But the source remained mysterious — doctors couldn’t find what the boy might have been touching, inhaling or eating, to have such high lead levels for months. When the boy started to have a stomachache and was admitted to the hospital, the doctors did an x-ray, which revealed large numbers of small round objects in the boy’s abdomen, according to the researchers, who published a case report in Aug. 8 issue of the New England Journal of Medicine. An x-ray image showing objects inside the abdomen. 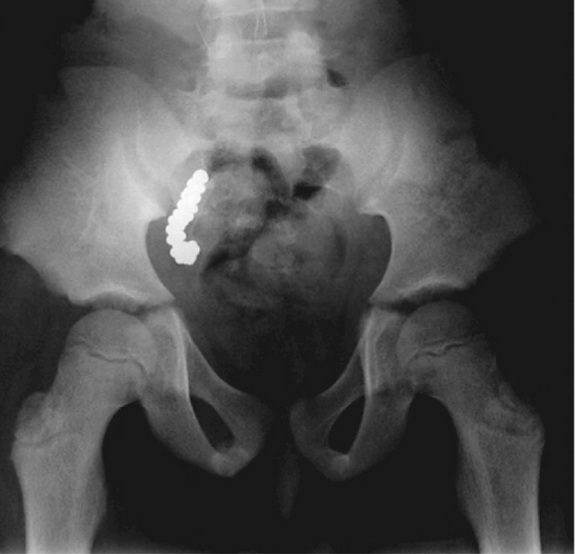 The metallic-looking objects were in the lower right side of the boy’s abdomen, appearing to be inside the digestive tract. The doctors immediately gave the boy a bowel washout, which should have cleared any object within his digestive tract, but a second x-ray showed the objects had not moved. The doctors suspected the unlikely scenario – the objects had to be in the boy’s appendix. In surgery, the doctors removed the boy’s appendix and cut it open, revealing 57 lead pellets trapped inside. The boy’s appendix weighed 5 times heavier than normal when containing the pellets, but other than few tissue scars, it was normal and wasn’t inflamed .